← In which a haircut is purchased. 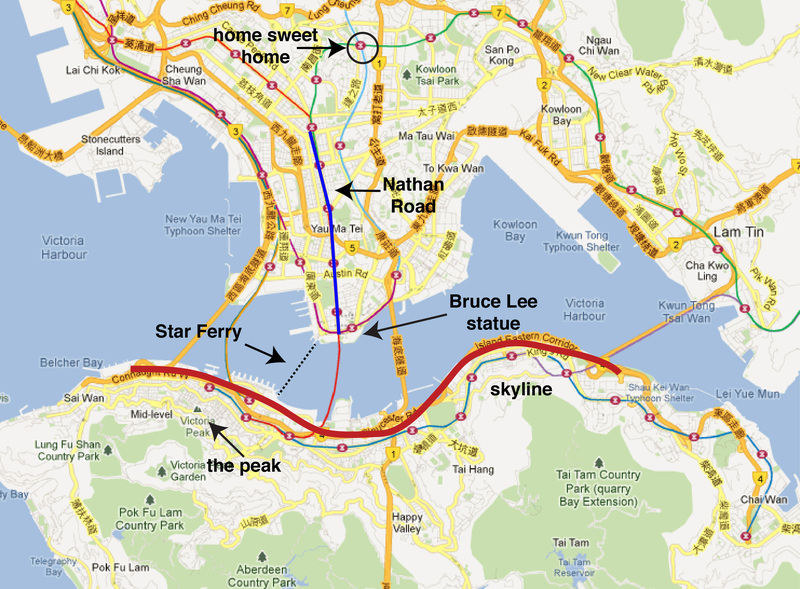 After my long-winded post about HK geography, a number of people asked me where exactly we are relative to famous landmarks. So here is a quick tour, using pilfered screenshots from Google Maps, and some photos we’ve actually taken. 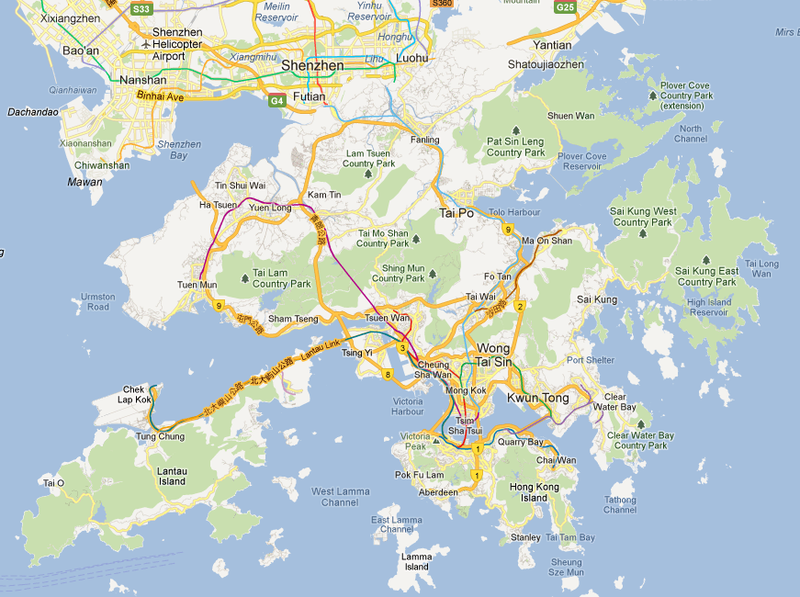 First, here is a HK overview. Click for a bigger version, if you wanna. Shenzhen, at the top, is the mainland China city that borders HK. Meanwhile, here is a zoomed-in and crudely annotated map. Home Sweet Home is at the Kowloon Tong station on the MTR. 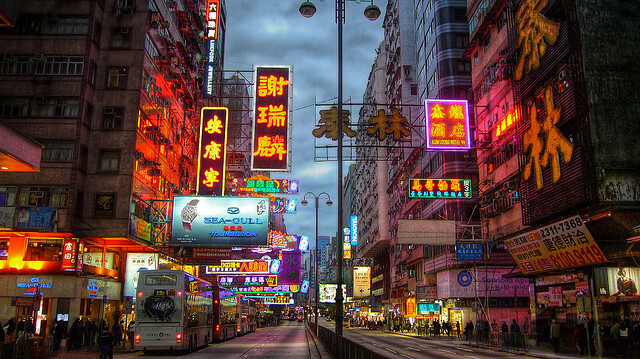 Nathan Road, via Flickr user joopdorresteijn. 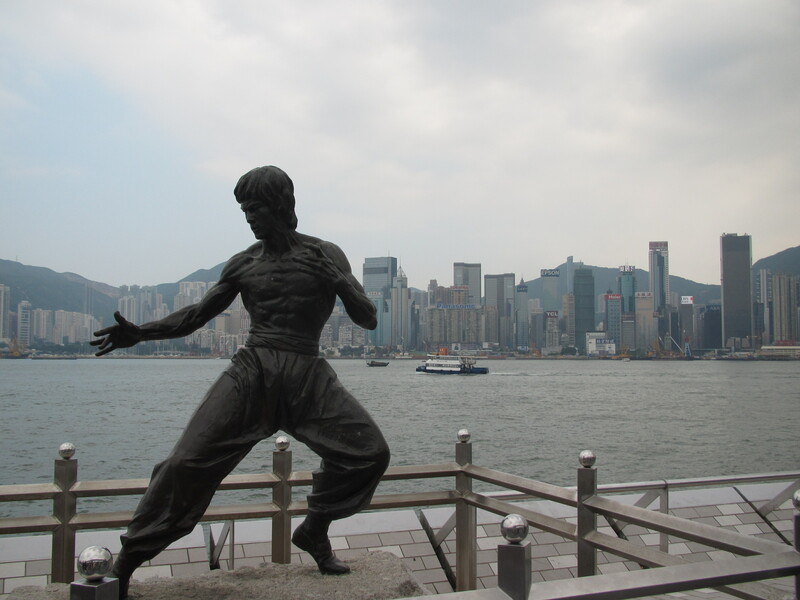 Bruce Lee, as you may know, gets his own awesome statue. Look, I took a poorly lit photo! Just across the water is, duh, the famous skyline of Hong Kong Island. The most fun way to get over there is via the famous Star Ferry, which takes about 9 min and costs HK$2.30, which is about US$0.30. You would think that there’s no way they could money at those prices, but the ferries run every six minutes and during peak hours are packed. The ferries are double-fronted, meaning that, like a subway train, once the boat has docked and new passengers have boarded, the pilot just walks to the other end of the ferry—no need to back out or turn around. And, in the same vein, the boats have these nifty wooden benches with seat backs that swivel on a pivot. So when you get on, you just grab the back of the bench and swing it to the other side so that you can always be facing forwards. Brilliant. 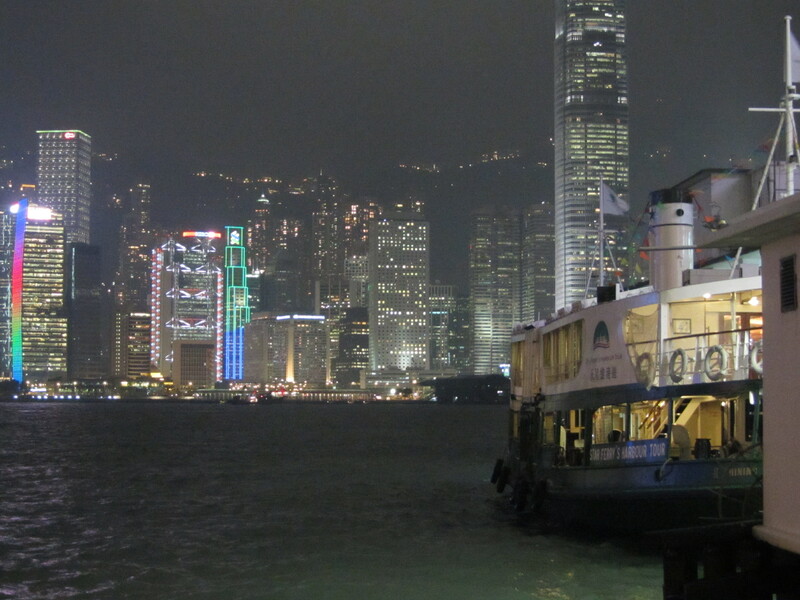 Here’s a cool shot that Cate got, looking from the Kowloon-side pier towards HK Island. 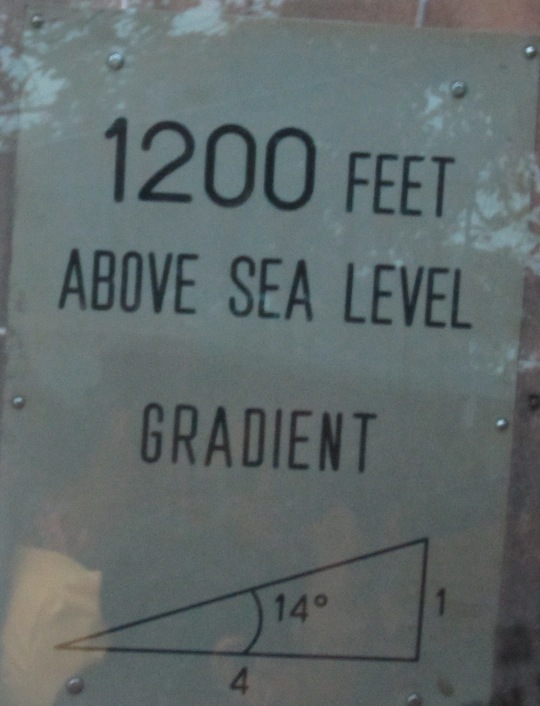 The other “must-see” tourist attraction is Victoria Peak, or just “the Peak.” There are some views. What’s especially weird about the Peak is that, like virtually everything in Hong Kong, the fancy viewing platform is in a mall. To get to it, you have to go up about six levels of escalators that take you through a slew of shops, some of them selling cheap trinkets, others selling luxury goods. You also pass a Burger King and a Bubba Gump Shrimp Company. So it is, to say the least, a bit surreal. The other fun aspect of going up to the Peak is the opportunity to take the Peak Tram, which slowly clugs its way up the mountain at a precipitous angle. Trigonometry explains why I’m about to fall backwards. The tram car aisle has odd lumps built width-wise into the floor. It is not at first glance clear what these are for (except possibly to trip unsuspecting tourists) until you are forced to stand during the tram’s descent. Then you realize that, when the tram is at its steepest angle, you have to stand on the floor ridge that has become parallel to the ground. And that, friends, is a weird sensation.